JERUSALEM (AP) — German Chancellor Angela Merkel arrived in Israel on Wednesday for the latest in a series of joint government consultations highlighting the countries’ close bond seven decades after the Holocaust, even as recent developments have tested the tight ties. Her two-day visit is expected to focus on bilateral economic issues, with an emphasis on innovation, technology and development projects. But looming in the background will be sharp differences in Israeli and German policies toward Iran and the Palestinians. Merkel, who is accompanied by much of her Cabinet, a large business delegation and her new czar for combatting anti-Semitism, will visit Israel’s Yad Vashem Holocaust memorial and receive an honorary doctorate from Haifa University. It’s the seventh such joint government meeting since Israel and Germany established the tradition a decade ago. Merkel headed to Jerusalem shortly after landing for dinner with Israeli Prime Minister Benjamin Netanyahu. Germany is Israel’s largest trading partner in Europe and for the past few decades has been perhaps its strongest ally. Israel was established three years after the end of World War II, and the German government has paid billions in reparations to Holocaust survivors and positioned itself as a leader in combatting anti-Semitism. But differences have been exacerbated following the election of U.S. President Donald Trump. Netanyahu has been one of Trump’s staunchest international supporters, lauding him for pulling out of the Iranian nuclear deal that Merkel and other world leaders helped negotiate in 2015. Netanyahu says the deal, which curbed Iran’s nuclear program, does not include enough safeguards to prevent the Islamic Republic from developing a nuclear weapons capability. Netanyahu’s rapport with Merkel has been cordial and even cool at times. Merkel has continued to champion the traditional approach to peacemaking, calling for the establishment of a Palestinian state and for Israel to refrain from unilateral steps to undermine its prospect. 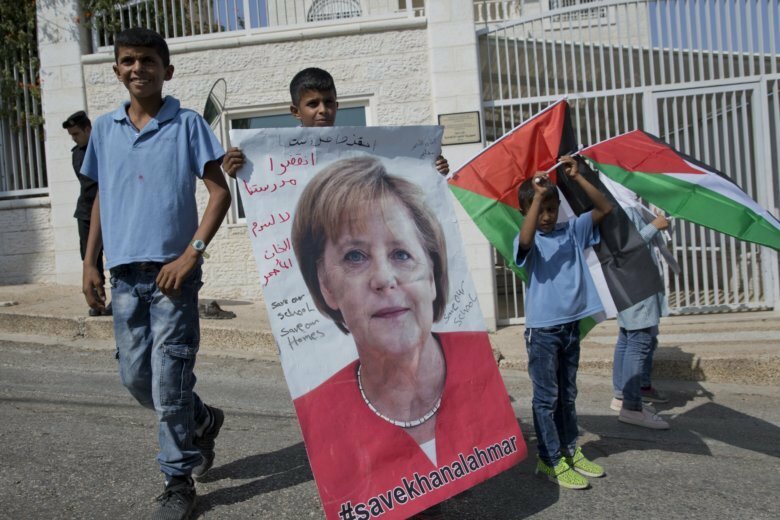 Germany, for instance, has been among the European countries calling on Israel to refrain from carrying out its plans to demolish a West Bank hamlet it says was illegally built. Israel has offered to resettle the 180 Bedouin Palestinian residents of the Khan al-Ahmar encampment a few miles (kilometers) away. But Palestinians and their European backers say the demolition is aimed at displacing Palestinians in favor of settlement expansion and would deal a devastating blow to hopes for Palestinian statehood. Israel’s Supreme Court recently rejected a final appeal against the plans and residents are bracing for the move any day. Israeli forces are unlikely to carry it out though during Merkel’s brief stay for fear of sparking a crisis. Regardless, Israeli officials say they don’t expect that issue — or Merkel’s long held preference to maintain the Iran deal — to overshadow the visit, which is expected to bring about new economic agreements, the creation of a formal youth exchange and a renewed commitment to combating anti-Semitism, after Israel raised alarm over several recent cases in Germany. Shimon Stein, a former Israeli ambassador to Germany, said that despite the Israeli government’s growing alliances with several eastern European countries in the battle against radical Islam, Germany remains its strongest and most significant European backer. The two countries established diplomatic ties in 1965, after which Germany began paying reparations for the Nazi-led Holocaust in which 6 million Jews were murdered. The first joint consultation was in March 2008, when Merkel and her Cabinet arrived to mark the 60th anniversary of Israel’s independence. During that three-day visit, Merkel addressed the Israeli parliament, in German, and expressed shame over the Holocaust. The 20-minute speech earned Merkel a standing ovation.